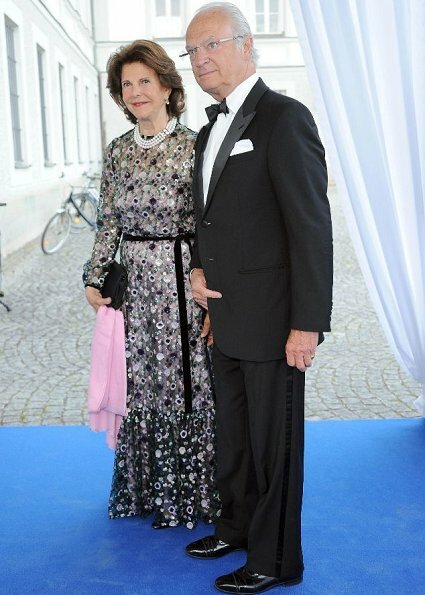 Queen Silvia is lovely in that dress. It softens her look along with the not-so-black hair and more subtle makeup. She looks more youthful. A lavender or gray shawl might be a better choice for color. The top of the sleeves looks a bit odd, as if they were pulled higher and then tacked there. All in all, though, it is a very nice look. Belle robe pour une belle reine. 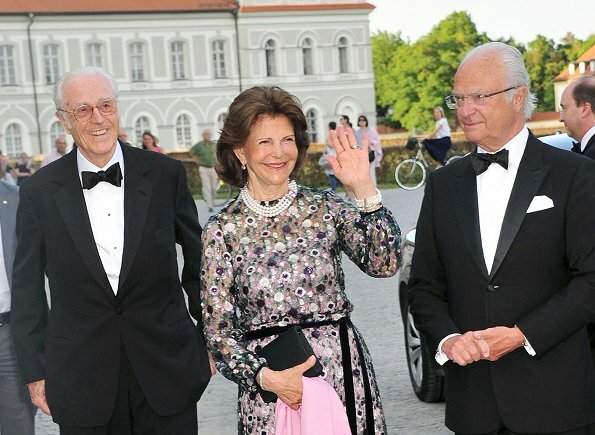 Well, that dress suits Queen Silvia very well and she looks lovely here (make-up, hair, her smile)! I think it's just a pity that it is a bit dark for a summer-evening in July - in Nymphenburg, where the sky is filled with a light blue-white. 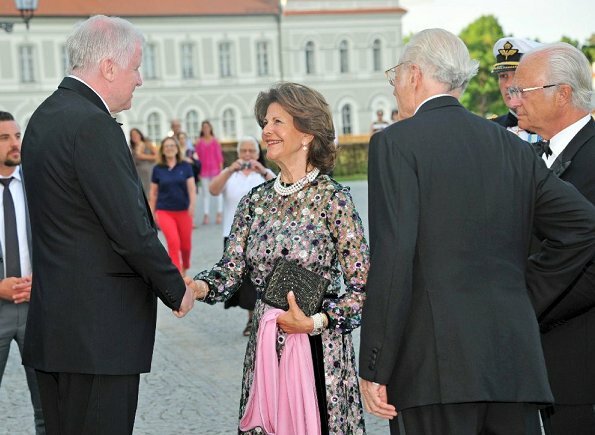 (Mr. Seehofer, Bavaria's "Ministerpraesident", was quite proud to shake their hands. Has he been there with his wife or girl-friend/ and Mum of the little daughter;)? RL give it a rest - you are the poison of this blog - the sentence in brackets is absolutely unnecessary. I guess, you must have a problem, dear "CatchTheScoop". Elle est royalement resplendissante. J'adore! 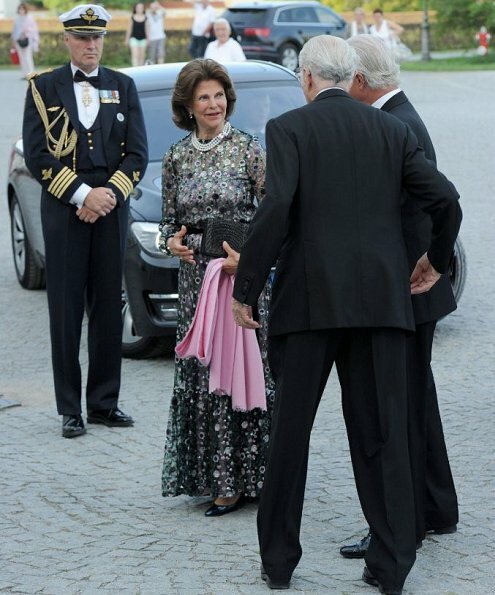 Queen Silvia looks very lovely and elegant in this floral dress. 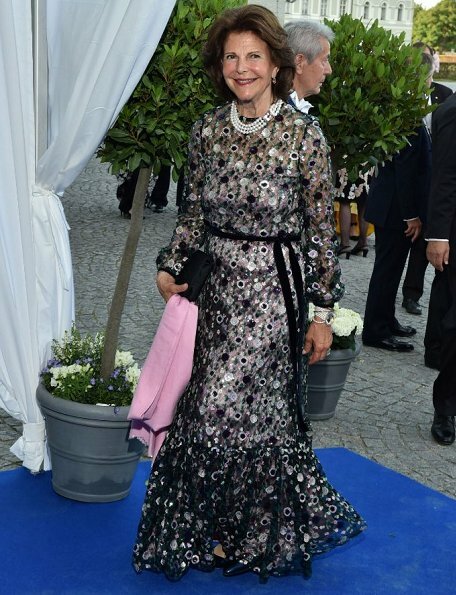 Its one of my favorite dresses on her and it makes her look years younger than her real age (no way do I believe she's a day over 52!!!). Love those pearls. Uhmmm, sorry, but Silvia for sure does not look like 52. I am a little over 52 and might know it ;-)) She looks exactly her age, which is 73. Of course she looks good and is in good condition. But she was lucky enough to lead a life without hard work and had every thinkable access to cosmetics, stylists, surgery, medical care and so on. That said, she looks really good here, the lighter hair color is much better than her usual dark helmet. Not so sure about the dress....and yes, definitely better underwear needed!! I like it very much - she looks great. The pattern on the fabric is out of the ordinary and the pearls are magnificent. Agree that a slightly different colour for the shawl might have been better and also (sorry) better undergarments needed. I was reluctant to mention the undergarment issue but as others have...I agree that would make a great difference to her appearance and help her seem younger. 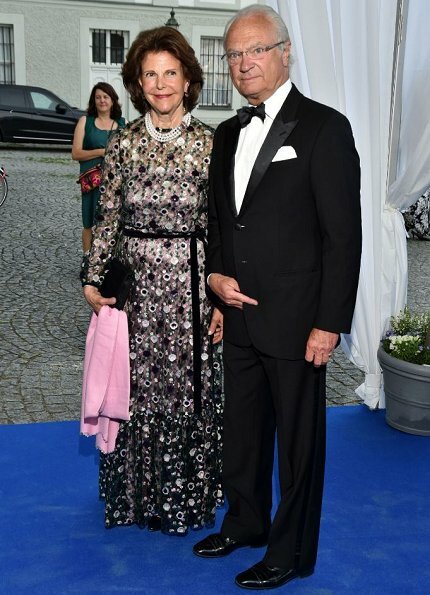 Königin Silvia sieht strahlend aus. 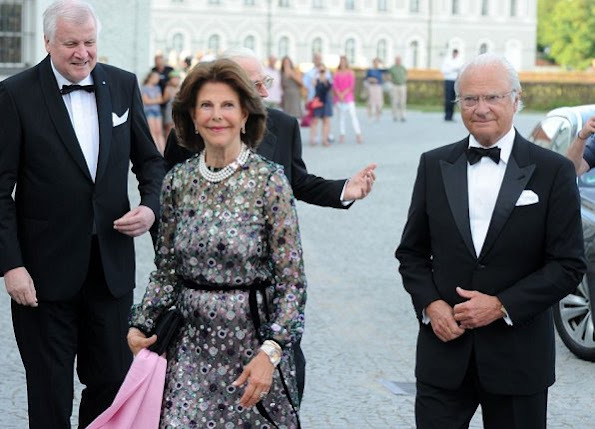 Man kann die junge Frau erkennen, in der sich der König von Schweden damals verliebt hat. Ich bin auch heilfroh, dass die meiner Ansicht verunglückten Versuche jünger auszusehen (Joker Face) allmählich in den Hintergrund treten. Manchmal ist es gar nicht gut, sich alle Treatments, die die Schönheitsindustrie sich so ausdenkt, leisten zu können. Auch wenn der bayerische Himmel in typischen Weiß-Blau erstrahlte, finde ich, ihr Kleid passt sehr gut zum Anlass. Mir ist aufgefallen, dass sie seit ihrer Erkältung (?) im letzten Jahr darauf achtet, ausreichend warm eingepackt zu sein. Man spricht zwar nicht darüber, aber da man es sieht: eine gute Shapwear (die beste, sie kann es sich doch leisten), würde den Body in Form halten und auch noch wärmen. Two Stones...Der Haarschnitt gefällt mir auch. Aber am schönsten finde ich ihr Lächeln, das sie so unglaublich jung wirken lässt. Happy birthday Herzog Max, übrigens! Really lovely! Stunning in fact.